Netanyahu would easily win fifth term as PM, poll shows, as Likud opens up massive lead over Yesh Atid, Zionist Union. 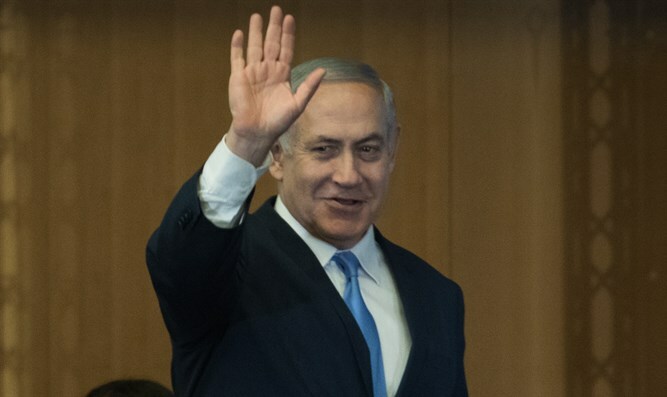 Prime Minister Binyamin Netanyahu would easily win a fifth term (and his fourth consecutive term) if new elections were held today, with the Likud continuing to gain ground following clashes with Iran and ahead of the planned transfer of the US embassy from Tel Aviv to Jerusalem. According to a poll conducted by Panels on behalf of Maariv, if new elections were held today, Netanyahu’s Likud would rise from 30 seats to 36 – its best performance since 2003, when at the height of the Second Intifada the party won 38 mandates. In a distant second place, former Finance Minister Yair Lapid’s Yesh Atid faction would win 17 seats – up from the 11 it won in 2015, but down from recent polls showing the faction winning 20-25 mandates. The predominantly Arab Joint List party would lose one seat if new elections were held today, the poll showed, falling to 12 mandates. The Zionist Union, a joint list including the Labor Party and the smaller Hatnua faction of former Justice Minister Tzipi Livni, would plummet from 24 seats to just 10. Former Environmental Protection Minister Avi Gabbay won control of the party in a leadership race in 2017, but has largely failed to halt the party’s decline in the polls. Education Minister Naftali Bennett’s Jewish Home party would gain a single seat if new elections were held today, winning nine total. Finance Minister Moshe Kahlon’s Kulanu party, which won 10 seats in 2015, is projected to fall to 7 seats in the next election. Among the haredi factions, the United Torah Judaism party would gain a single mandate, rising to seven seats, while Aryeh Deri’s Shas would fall from seven to four, barely clearing the 3.25% minimum electoral threshold. Defense Minister Avigdor Liberman’s Yisrael Beytenu, which won six seats in 2015 but fell to just five seats in 2016 after MK Orly Levy split off from the faction, would win six seats in new elections, the poll showed. MK Levy, who has declared her intentions to run for reelection at the head of a new party, would win 6 six seats if new elections were held today. The far-left Meretz party would gain a single mandate, winning six seats. A new party headed by former Defense Minister Moshe Yaalon, who bolted the Likud after he was replaced by Avigdor Liberman as DM, would not clear the 3.25% minimum threshold. Nor would Zehut, the new faction of former Likud MK Moshe Feiglin, or the Yahad party led by ex-Shas chief Eli Yishai.